Photographer and motion artist Daniel O’Neill talks about the logistics of producing both stills and video for a commercial client, why Mongolian horsemen make a great photo crew, and how new technology has made it more important for image makers to travel with their own gear instead of renting it on location. Aimee Baldridge: You do a wide variety of work, but most of it is in the area of fashion and editorial, right? Daniel O'Neill: It is. As long as I have people in front of me, I'm the most comfortable. Whether it's traveling and seeing new faces, or beautiful faces that somebody hires and puts in front of me to shoot, or just looking for beauty in unusual faces, that's what I enjoy most. AB: And you’ve been in the industry for over 20 years, so you made the transition from film to digital, and then from digital still to motion. Daniel O'Neill: That’s correct. When I started photography I would print everything myself, and develop my own film. I did a lot of black and white early on, and then I learned how to print color. And then Photoshop came along and it sort of brought the darkroom to your computer. Digital came along, and I figured out how to maintain a style in my work, and use the different tools to do it. And then digital video came along. Now I'm figuring out how to edit and use all of the tools that go with that. AB: What kinds of cameras have you shot with during this evolution? Daniel O'Neill: I started with a big Pentax 67. I have two Mamiya RZs. I've got a Technika 4x5 field camera, a Contax G2, and a Fuji GW690. I've got a couple Polaroid cameras—you know, the 110Bs with the Polaroid back so you can shoot type 55 with negatives. I have the 1Ds Mark III and two 5D Mark IIs. I used those for video in the beginning. Now I have a Sony FS700 for video. I actually still have every camera I ever bought. AB: Since you own all that gear, do you travel with it instead of renting on location? Daniel O'Neill: As clients want to do more with both stills and motion, you're required to bring more gear to each project. And everyone is really customizing their equipment. I don't want to be without my cameras now, whereas before I could always rent a camera. Now, cameras have a specific feel and build with all of the different rigging you can do that makes them your own—the way I have my monitor hooked up onto the camera and oriented for my eye, the way that my hand will sit on the body, the follow focus. Having a personalized camera makes the workflow much easier for me. My hands know where everything is. I'm ready to shoot. I always carry the maximum onto the plane. I have a camera backpack or shoulder bag that has most of my bodies, lenses, cards, and whatever is my most expensive mandatory equipment that I'm going to need when I land. So if everything else got lost, if worst came to worst, I could still shoot something. And then I always bring a second bag, like a man-purse, that I can put my laptop or a book in. I've been using Tenba bags since I started. So I've got your Air Cases, your carry-on camera bags, a tripod case, and a big light case. AB: Why have you been using Tenba bags all this time? Daniel O'Neill: Because they're bulletproof and they work. I’ve always appreciated the build quality. They're a heavy nylon bag. They have great zippers. You don't skimp and use some crappy little zipper that's going to break. And I’m always at the limit of how much stuff I can put in. If you give me a big bag, I can fill it. AB: You've never had any problems with equipment getting damaged en route? Daniel O'Neill: I have not. You know, I went on a trip to Mongolia where I had to bring everything—lighting, video cameras. We went through Korea to Ulaanbaatar and all the way out to Bayan-Ölgii, flying in different planes. In Bayan-Ölgii we loaded everything into Jeeps, drove out to the Altai Mountains, and got on horseback. And the stuff lasted. Everything worked. AB: What was the trip to Mongolia for? Daniel O'Neill: It was for the Peregrine Fund, which is an organization that saves birds of prey. 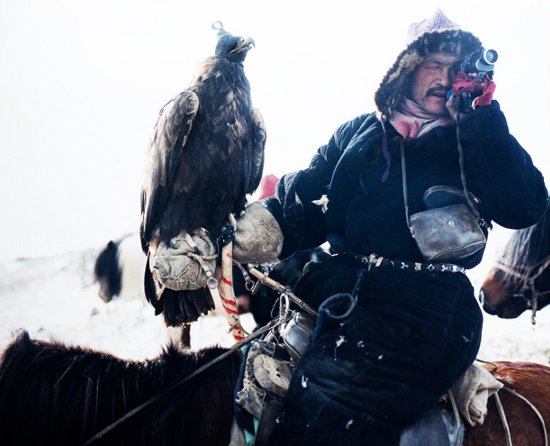 We went for two weeks to hang out with the eagle hunters, because they're one of the last groups of people that use birds of prey to make their living. We got to go with a couple of ornithologists, including Bill Burnham, who was the foremost expert on birds of prey. It was one of the highlights of my photographic career. I shot video, and we shot hundreds of rolls of medium format film. A lot of it was shot from horseback, run-and-gun style. We were moving the whole time, and it was oppressively cold. AB: Were you an experienced rider? Daniel O'Neill: No. I was comfortable riding, but I certainly had never spent two weeks on horseback. I'm also six foot four and 220 pounds, and I don't think the horse enjoyed it any more than I did the first couple days. It was a rough go for both of us. AB: Do you have any tips for shooting on horseback? Daniel O'Neill: It just takes a little getting used to. I fell off more than once. They have small horses called Tahkis in Mongolia, so if you fall, it's not really that far down. AB: How did you carry your gear on all those different modes of transport? Daniel O'Neill: We had a lot of it in cases. There were eight or nine hunters that we went out with. They were a hearty group of people. They're not impressively big, but as far as their strength and willingness to help—they just jumped right in and became part of the crew. They would grab stuff and throw it over their shoulder, or put something on the front of their horse. AB: So Mongolian horsemen make a good photo crew. Daniel O'Neill: They would make a great photo crew. And they're beautiful people, as comfortable as could be in front of a camera. They don't really give any thought to what they should do in a picture or shouldn't do. They just are. AB: That was probably a very different experience from working with people who are used to being in front of the camera as professionals. Daniel O'Neill: Even with people on the street here, there's always an expectation of what they want to look like. I know I have that too. I see a picture of myself and I have an expectation of how I'd like it to look. But in Mongolia, they didn't have an expectation. They just act the way they think they should act, and there's no pretense at all as to how their image differs from who they are. It's the same thing. There's a freedom to people like that, a comfort within themselves, that I find so appealing. Their personal expectation is different. They're grateful for almost everything they have, and it shows in the way they look, the way they are, and the way they live. You see life in their eyes. You take a picture and there's a depth to them that oftentimes I don't see when I'm working. It's almost impossible to recreate commercially. AB: What is the scale of commercial productions that you work on like? Daniel O'Neill: It can be as big as the client needs. On a still shoot that’s a pretty big job, maybe I would have two or three assistants, a stylist, a stylist assistant, a makeup artist, a creative director, an art director possibly. With motion, the crew size doubles and triples. Part of the challenge is realizing how many things you have to delegate. I am used to being very proactive and doing things as much as I can myself, and my assistants usually are just there helping me. With motion, you realize that you need all those other people because there are just a lot of elements that need to be covered. Grip is an additional three or four people. You also have a lot of production assistants, because now you've got the whole element of sound and keeping the set quiet. So I would say a big crew for me in still would be ten people and a small crew for me in motion would be ten people. AB: Are your clients asking for packages that include stills and motion? Daniel O'Neill: Yes, that’s how it happens. A lot of times, clients are aware that their competitors are doing it, and that it’s readily available. If they’re familiar with your work, they know that it's something you do, and that always comes up in a conversation. AB: Adding a motion shoot must increase the cost for clients quite a bit. Daniel O'Neill: It does. And that’s one element that I don't think of a lot of people have grasped yet. It’s easy to think, "Oh, I’ll shoot some stills and I'll shoot a little video." If you really want to do video right, it needs to be its own entity. I'm not able to control the quality of both things in the same movement. I don't like the distraction of trying to do one while I'm doing the other. If a client wants me to do both, I like to set them up and say, "I'll shoot video one day, and I'll shoot stills one day." AB: Is it usually an option to extend the shoot like that? What are the logistics like? Daniel O'Neill: Here's how I present it: "If you want it to be done right, and done beautifully, then that's what it's going to take. If you just want extra footage, then we could have somebody else come in and shoot behind-the-scenes video." There is a difference in the way I light something for stills and motion. Although they can be similar, they're not exactly the same. You can arrive at the same look, but they usually aren't set up the same way. Video shows everything—like if a garment needs to be clipped or taken in. If it's not done perfectly, you're going to see it, whereas in a still, you may be able to hide things that you don't want to see. In motion, it's not as easy to hide things. So there is definitely more planning that has to go into it. If you use a garment and then decide you want to shoot it later in the day doing something different, continuity comes into play: How exactly was it being worn? How was the hair? Did she have a scarf on? Was she holding something in her hand? It’s easy to show different still images and have all the variations make sense. But if you're showing something in a video, for continuity's sake you have to follow a different protocol to make it all work. There has to be a concept that allows you to use different garments or different people within a setting so that it flows together. Otherwise, you don't believe what you're looking at. Something will jump out, and it's amazing how much you notice a mistake when it's in the flow of a timeline. It's painfully obvious. AB: So, you're doing this combination of advertising, editorial, motion, and still. What do you think the right combination of those elements is these days for a person to make a good living? Daniel O'Neill: It continues to evolve. At the end of the day, I just keep reminding myself why I do this, and why I started doing it, and that's what keeps me going. I think it's a whole new world, and you just have to follow what makes the most sense to you. I really don't know what the formula is to monetize everything you do. AB: So why did you start doing it? Daniel O'Neill: I love beautiful stuff that I can look at over and over. If I see something that I find appealing or beautiful or that moves me or touches me, and I can capture that for myself, it's almost like hunting. I'm hunting for something that I find visually stimulating. I just think photography's the coolest thing in the world. You see something and you push your button and all that light lights itself onto the film or the sensor, and there it is. Whatever's in that moment in the history of the world, you get to keep it. It's yours. You can see more of Daniel O'Neill's work on his photography and motion sites.